Muscat: Students in Oman who submit plagiarised work or pay others to write their assignments for them run the risk of immediate expulsion if they are caught by the Ministry of Higher Education’s electronic system. Known as contract cheating, the process sees students pay professional writers and other subject experts a fee that varies on the word count, the depth of research required for the assignment, and the amount of time that remains before the submission deadline. Moza Ahmed Al Weshahi, Director of the Academic Programmes Department at the Ministry of Higher Education, told Times of Oman, “This practice cannot be completely prevented. However, the Ministry has an electronic system that measures literary and academic plagiarism when students are handing over their project. “Trade in academic projects is a global issue and there are official institutions around the world that offer these services that students can access from inside or outside the Sultanate. These companies learn how to overcome systems that detect academic plagiarism, so they do not get caught violating them. She went on, “This problem can only be reduced by increasing student awareness of the importance and benefits of personal effort in their studies. If a student buys an assignment, he or she may receive the assessment, grades and certificate that they aspire to. However, this plagiarism will be discovered as soon as the student enters the job market and the skills that he or she has actually acquired are tested.” “Students have to work hard and learn from the difficulties they face rather than resorting to cheating with commercial institutions, which also cheat the student as, in some cases, the plagiarism is revealed by the system and the student loses both the grade and the money,” added Al Weshahi. University professors in Oman say that students who do engage in contract cheating, either by hiring or being hired by others, could face immediate expulsion. In addition to a number of websites that offer such services, many contract cheaters also advertise on social media, making it easier for students to seek them out. Al Mahanad Al Badi, an English language instructor at Mussanah College of Technology, said laws need to be in place to punish those who engage in contract cheating. “Unfortunately, some people play on the needs of students, and advertise writing reports on their behalf,” he explained. “This culture does not belong in Oman. We find out these students have cheated because the work is simply too good to be their own. If you know the student, work that is not their own stands out and I usually ask the student to explain. Of course, we have strong policies against contract cheating, but it is difficult to pick up sometimes, unless you know the student. 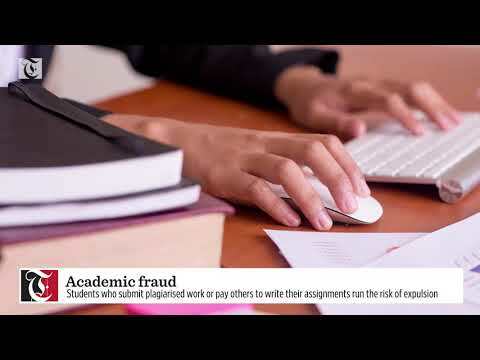 Mohammed Yassen, Director of e-learning at Majan University College, explained that contract cheating goes against the personal and academic integrity that needs to be part of any assignment a student undertakes. One website also offered easy payment plans for students all over the world, as a method of encouraging repeat business. This website charged a rate of $8.95 per page (about OMR3.5 per page), with services including 24-hour support, free references, unlimited revisions, VIP support, access to the top 10 writers the service employed, and an editing proofread. It also promised delivery of the assignment in five days. The standard service – priced at $6.95 (about OMR2.7) per page, offered the same perks, but with guaranteed delivery in a week’s time. More expensive services offered guaranteed delivery in three days ($10.95, about OMR4.25 per page) and even in 24 hours’ time ($15.95, about OMR6 per page). The site also came with bundle offers, such as providing students with free assignment titles, a free table of contents, and a free bibliography. Another site offered tiered services for Bachelor’s, Master’s and Doctorate students, with pricing based on the subject, the urgency, the formatting, the number of sources and the subject matter. A 10-page assignment would set Bachelor’s student back $167.64 (about OMR65), while a Master’s student would have to pay $186.26 (about OMR72) and a Doctoral candidate would need to shell out $242.14 (about OMR93), assuming the assignment was due in one or two months, with the price steadily increasing as the time limit decreased. Similar services were available on social media, where they encourage students to reach out to them via direct messages, often accompanied by catchy marketing slogans that persuaded students to contact them, with phrases such as ‘College got me feeling guilty when I am breathing because I could be doing homework’ and ‘Don’t allow assignments to take a toll on you’, in addition to providing special rates on public holidays. Another student added, “Many of the friends I used to study with never bothered writing the assignments themselves. They would just pay someone to do the work for them, and then they would buy the engineering models for these assignments from e-commerce sites like eBay, when we were supposed to do the work ourselves. Times of Oman also spoke to professional academic writers to find out why they decided to take up such assignments.